The Island Frozen Yogurt is a proud member of the CVC in St. Louis. Fun fact: Soulard often gets referred to by its residents as “The Island.” Why? On a plat map, or a map drawn to scale showing the divisions of a piece of land, Soulard sets itself apart from the city. 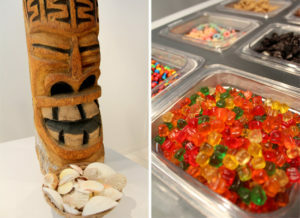 Staying true to his “Islander” roots, owner Jason Stump plays on the theme of his neighborhood with The Island Frozen Yogurt (1009A Russell Boulevard; 314-664-6678), a tropically themed shop specializing in frozen treats and sweet toppings sold by the ounce. General manager Jennifer Groby says that since its opening, customers stop in every now and then joking that Stump brought the Island to “The Island,” but mostly, people seem ecstatic about the existence of the area’s first purveyor of frozen yogurt. Stump began conceptualizing his shop about a year ago when he noticed the vacant space open in the Soulard Fine Arts Building. Somewhat serendipitously, the building originally housed a dairy in the early 1900s, as evidenced by its exterior facade featuring a sculpted dairy girl and cow. Nowadays, the space features everything from a mosaic wave at the entry point and sparkling interior Tiki hut to palm trees and a cleverly constructed counter top filled with sand, seashells and beach-themed figurines. Expect to hear the sounds of UB40 and the like while choosing from six different flavors or three swirl combinations at a time, with varieties switched out regularly. 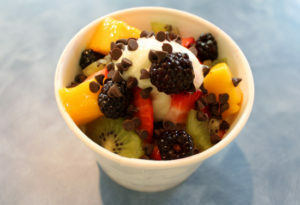 The toppings bar features typical garnishes to personalize cups, such as cookie bits, candy pieces, fruit-flavored boba, sauces, sprinkles and whipped cream, with the added bonus of fresh fruit chunks from the Soulard Farmers’ Market down the street.